Amit, S. (2015) Mindful ACT: Achieve, Connect, Thrive. Accessed on 5 May 2016, www.ask-your-coach.com. Ashford. S, & DeRue D. (2012) ‘Developing as a Leader: The power of mindful engagement’. Organizational Dynamics 41, 146–154. Babauta, L. (2009) Zen Habits: Handbook for life. Kickstarter.com. Baird, B., Smallwood, J., Mrazek, M. D., Kam, J. W., Franklin, M. S. & Schooler, J. W. (2012) ‘Inspired by Distraction: Mind wandering facilitates creative incubation’. Psychological Science 23, 1117–1122. Baltes, P. B. & Staudinger, U. M. (2000) ‘Wisdom: A metaheuristic (pragmatic) to orchestrate mind and virtue toward excellence’. American Psychologist 55(1), 122–136. Bar-On, R. (1988) The Development of a Concept of Psychological Wellbeing. Doctoral Dissertation: Rhodes University, South Africa. Bazarko, D., Cate, R., Azocar, F. & Kreitzer, M. J. (2013) ‘The Impact of an Innovative Mindfulness-Based Stress Reduction Program on the Health and Well-Being of Nurses Employed in a Corporate Setting’. Journal of Workplace Behavioral Health 28(2): 107–133. doi:10.1080/ 15555240.2013.779518. Beckman, H. B., Wendland, M., Mooney, C., Krasner, M. S., Quill, T. E., Suchman, A. L. & Epstein, R. (2012) ‘The Impact of a Program in Mindful Communication on Primary Care Physicians’. Academic Medicine 87(6), 1–5. doi: 10.1097/ACM.0b013e318253d3b2. Beldoch, M. (1964) ‘Sensitivity to Emotional Expression in Three Modes of Communication’. In: J. R. Davitz (ed.) The Communication of Emotional Meaning. New York: McGraw-Hill, 31–42. Bhikkhu, B. (1998) Mindfulness with Breathing: A manual for serious beginners. Somerville, MA: Wisdom Press. Bodner, T. E. & Langer, E. J. (2001, June) Individual Differences in Mindfulness: The mindfulness/mindlessness scale. Poster presented at the 13th Annual American Psychological Society Conference, Toronto, Ontario, Canada. Boyatzis, R. E. & McKee, A. (2005) Resonant Leadership: Renewing yourself and connecting with others through mindfulness, hope, and compassion. Harvard Business School Press: Boston. de Brabandère, L. (2014) Coursera Online Course, On Strategy: What managers can learn from great philosophers. 1 - 4 - 1.4 Innovation vs Creativity (04-41).mp4. Retrieved on 6 December 2016. Brach, T. (2003) Radical Acceptance. Random House: New York. Brantley, J. & Kabat-Zinn, J. (2007) Calming your Anxious Mind: How mindfulness and compassion can free you from anxiety, fear and panic. Oakland, CA: New Harbinger Publications. Brown, N. J., Sokal, A. D. & Friedman, H. L. (2013) ‘The Complex Dynamics of Wishful Thinking: The critical positivity ratio’. American Psychologist 68(9), 801-813. Bush, M. (2015) Personal Interview at the Mindfulness Summit, 22 October 2015. Calaprice, A. (2005) The New Quotable Einstein. Princeton University Press: Princeton, NJ. 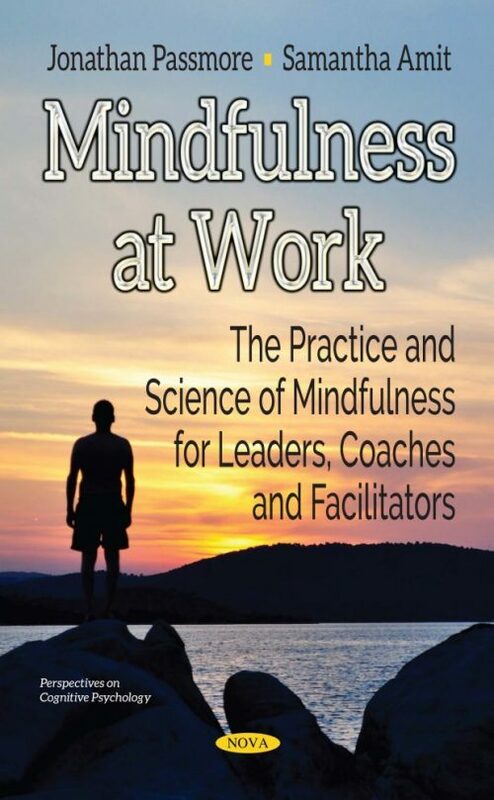 Chaskalson, M. (2011) The Mindful Workplace: Developing resilient individuals and resonant organizations with MBSR. Chichester: Wiley. Christakis, N. A. & Fowler J. H. (2009) Connected: The surprising power of our social networks and how they shape our lives. New York: Little Brown. Christopher, M. S., Goerling, R. J., Rogers, B. S., Hunsinger, M., Baron, G., Bergman, A. L. & Zava, D. T. (2015) ‘A Pilot Study Evaluating the Effectiveness of a Mindfulness-based Intervention on Cortisol Awakening Response and Health Outcomes Among Law Enforcement Officers’. Journal of Police and Criminal Psychology 4(1). doi: 10.1007/s11896-015-9161-x. Collins, J. (2001) Good to Great. London: Random House. Cooper-Peel, C. (2015) Email Interview undertaken in April 2015. Covey, S. (1989) Seven Habits of Highly Effective People. Simon & Schuster: London. Dalen, J., Smith, B., Shelley, B., Sloan, A., Leahigh, L. & Behay, D. (2010) ‘Pilot Study: Mindful eating and living: weight, eating behaviour and psychological outcomes associated with a mindfulness-based intervention for people with obesity’. Complementary Therapies in Medicine, 18, 260–264. Dane, E. & Brummel, B. (2014) ‘Examining Workplace Mindfulness and its Relations to Job Performance and Turnover Intention’. Human Relations 67(1), 105–128. Davidson, R. (2012) The Emotional Life of Your Brain – How Its Unique Patterns Affect the Way You Think, Feel, and Live and How You Can Change Them. Penguin: London. Doherty, R. W. (1997) ‘The Emotional Contagion Scale: A measure of individual differences’. Journal of Nonverbal Behavior 21(2): 131–154. doi:10.1023/A:1024956003661. Dweck, C. (2007) Mindset: The new psychology of success. Ballantine: New York. Elrod, H. (2016) The Miracle Morning: The not-so-obvious secret guaranteed to transform your life (before 8am). London: Hodder & Stoughton. Erickson, T. (2009) ‘Gen Y in the Workforce,’ Harvard Business Review 87(2), 43–49. Fleming, A. W. (2006) Positive Psychology ‘Three Good Things in Life’ and Measuring Happiness, Positive and Negative Affectivity, Optimism/Hope, and Well-Being. Counselor Education Master’s Theses. Paper 32. Retrieved on 27 July 2016 from http://digital commons.brockport.edu/cgi/viewcontent.cgi?article=1031&context=edc_theses. Fogg, B. J. (2012) Forget Big Change, Start with a Tiny Habit: TEDxFremont. Retrieved on 27 July 2016 from https://www. Fredrickson, B. (2009) Positivity: Ground breaking research reveals how to embrace the hidden strength of positive emotions, overcome negativity and thrive. New York: Random House. Fredrickson, B. L., Cohn, M. A., Coffey, K. A., Pek, J. & Finkel, S. M. (2008) ‘Open Hearts Build Lives: Positive emotions, induced through loving-kindness meditation, build consequential personal resources’. Journal of Personal Social Psychology 95(5), 1045–62. doi: 10.1037/ a0013262. Fredrickson, B. L. & Losada, M. F. (2005) ‘Positive affect and the complex dynamic of human flourishing’. American Psychologist 60(7), 678–686. doi:10.1037/0003-066X.60.7.678. Frith, C. D. & Frith, U. (2007) ‘Social Cognition in Humans’. Current Biology 17, R724–R732. Fukuyama, F. (1995). Trust: The social virtues and the creative prosperity. New York: Free Press. GGSC (2017) Defining Mindfulness. Retrieved on 7 February 2017 from http://greatergood.berkeley.edu/topic/mindfulness/definition. Glasser, J. (2014) Conversational Intelligence: How great leaders build trust and get extraordinary results. Bibliomotion: Brooklin, MA. Goleman, D. (2013) Focus: The hidden driver of excellence. New York: HarperCollins. Grant, A. M. (2017) The Psychology of Coaching, Israel’s Coaching Chamber Annual Conference, Tel Aviv, Israel. Haigh, E. A. P., Moore, M. T., Kashdan, T. B. & Fresco, D. M. (2011) ‘Examination of the Factor Structure and Concurrent Validity of the Langer Mindfulness/Mindlessness Scale’. Assessment. 18(1), 11-26. doi: 10.1177/1073191110386342. Hanson, R. (2015) Personal Interview at the Mindfulness Summit, October 2015. Harris, T. (2015) Attention Economy. Retrieved on 3 July 2016 from http://www.themediaflow.com/blog/attention-economy-are-weconstantly-distracted. Harris, T. (2016) Wisdom 2.0. Conference Presentation. Tel Aviv, Israel. Hatfield, E., Cacioppo, J. T. & Rapson, R. L. (1993) ‘Emotional Contagion’. Current Directions in Psychological Science (CDPS) 2: 96–100. doi: 10.1017/cbo9781139174138. Holt, S., Marques, J. F. & Way, D. (2012) ‘Bracing for the Millennial Workforce: Looking for ways to inspire generation Y’. Journal of Leadership, Accountability and Ethics 9(6), 81–93. Holzel, B., Carmody, J. & Vangel, M. (2011) ‘Mindfulness Practice Leads to Increases in Regional Brain Gray Matter Density’. Psychiatry Research: Neuroimaging 191:36–42. Hougaard, R. (2015) Innovation, Performance, and Mindfulness: Loren Shuster interview. Retrieved on 6 December 2016 from https://www.youtube.com/watch?v=DoIlkpg5fzM. Ingram, R. E. (1990) ‘Self-focused Attention in Clinical Disorders: Review and a conceptual model’. Psychol. Bull. 107, 156–176. doi: 10.1037/ 0033-2909.107.2.156. Ireland, T. (2014) ‘What Does Mindfulness Meditation Do to Your Brain?’ Scientific American, Retrieved on 1 November from: http://blogs. scientificamerican.com/guest-blog/what-does-mindfulnessmeditation-do-to-your-brain/. Isaksen, S. (1998) A Review of Brainstorming Research. Creative Research Group: Monograph 302. Retrieved on 5 February 2017 from http://www.cpsb.com/resources/downloads/public/302-Brainstorm.pdf. Janis, I. L. (1972) Victims of Groupthink. New York: Houghton Mifflin. Kabat-Zinn, J. (1994) Full Catastrophe Living: How to cope with stress, pain and illness using mindfulness meditations. London: Piatkus. Kabat-Zinn, J. (2004) Wherever You Go, There You Are: Mindfulness meditation in everyday life. London: Piatkus. Kabat-Zinn, J. (2005) Coming to Our Senses: Healing ourselves and the world through mindfulness. New York: Hyperion Books. Killingsworth, M. A. & Gilbert, D. T. (2010) ‘A Wandering Mind is an Unhappy Mind’. Science 330, 932–933. Klatt, M. D., Buckworth, J. & Malarkey, W. B. (2009) ‘Effects of Low-dose Mindfulness-Based Stress Reduction (MBSR-ld) on Working Adults’. Health Education Behavior 36(3):601–14. doi: 10.1177/ 1090198108317627. Kofman, F. (2013) Conscious Business: How to build value through value. Boulder, CO: Sounds True. Kohlberg, L., Levine, C. & Hewer, A. (1983. Moral Stages: A current formulation and a response to critics. Basel, NY: Karger. Krentzman, A. R., Mannella, K. A., Hassett, A. L., Barnett, N. P., Cranford, J. A., Brower, K. J. & Meyer, P. S. (2015) ‘Feasibility, Acceptability, and Impact of a Web-based Gratitude Exercise Among Individuals in Outpatient Treatment for Alcohol Use Disorder’. The Journal of Positive Psychology 10(6): 477–488. Langer, E., Russell, T. & Eisenkraft, N. (2009) ‘Orchestral Performance and the Footprint of Mindfulness’. Psychology of Music 37(2), 125–136. Langer, E. (2015) Science of Mindlessness and Mindfulness. Interview with Krista Tippett. Retrieved on 11 September 2015 from https://www.onbeing.org/programs/ellen-langer-science-ofmindlessness-and-mindfulness/. Langer, E. (2016) Mindfulness Scale. Retrieved on 6 December 2016 from: http://langermindfulnessinstitute.com/research-lab/. Leuner, B. (1966) ‘Emotional Intelligence and Emancipation’. Praxis der Kinderpsychologie und Kinderpsychiatrie 15: 193–203. [Child psychology and child psychiatry]Lewin, K. (1947) ‘Frontiers of Group Dynamics: Concept, method and reality in social science, social equilibria, and social change’. Human Relations 1: 5–41. doi:10.1177/001872674700100103. Libbey, C. (2016) ‘How does Google use Mindfulness to Build Resilience for Employees, the Community, and the World at Large?’ Conference Presentation. Wisdom 2.0. Mindfulness Conference. 12 February 2016, Tel Aviv, Israel. Marci, C. (2012) ‘A Biometric Day in the Life: Engaging across media’. Paper presented at Rethink 2012. New York, 28 March 2012. Mark, G., Gudith, D. & Kloche, U. (2008 ) ‘The Cost of Interrupted Work: More speed and stress’. CHI 2008. Proceedings of the SIGCHI Conference on Human Factors in Computing Systems. ACM, New York. USA. Retrieved on 2 July 2016 from https://www.ics.uci.edu/ ~gmark/chi08-mark.pdf. Marlow, P. (2015) ‘Microsoft: Change the way you lead’. Women Think Next Conference, Tel Aviv, Israel. Marques. J. F. (2015) ‘Leadership Excellence’. HR.com Conference. August 2015. Morse, G., Salyers, M. P., Rollins, A. L., Monroe-DeVita, M. & Pfahler, C. (2012) ‘Burnout in Mental Health Services: A review of the problem and its remediation’. Administrative Policy Mental Health 39: 341-352. doi:10.1007/s10488-011-0352-1. Nowicki, S. J. & Duke M. P. (1994) ‘Individual Differences in the Nonverbal Communication of Affect: The diagnostic analysis of nonverbal accuracy scale’. Journal of Nonverbal Behavior 19: 9-35. Oberst, U. & Stewart, A. E. (2002) Adlerian Psychotherapy: An advanced approach to individual psychotherapy. Hove: Routledge. Osborne, A. F. (1953) Applied Imagination: Principles and procedures of creative thinking. NY: Charles Scribner’s Sons. Owen, D. (2014) The Hubris Syndrome: Bush, Blair and the intoxication of power. London: Methuen Publishing. Payne, W. L. (1985) A Study of Emotion: Developing emotional intelligence; self-integration; relating to fear, pain and desire. Diss: The Union for Experimenting Colleges and Universities, USA. Petrides, K. & Furnham, A. (2001) ‘Trait Emotional Intelligence: Psychometric investigation with reference to established trait taxonomies’. European Journal of Personality 425–448. Pew Research Center (2010) Retrieved on 16 November 2016 from http://www.pewsocialtrends.org/files/2010/10/millennials-confidentconnected-open-to-change.pdf. Pew Research Center (2015). Mobile Messaging and Social Media Research 2015. Retrieved on 4 February 2017 from http://www. pewinternet.org/2015/08/19/mobile-messaging-and-social-media-2015/. Potter-Efron, R. (2012) Calming the Angry Brain: How understanding the way your brain works can help you control anger and aggression. Oaklands, CA: New Harbinger. PWC (2011) Millennials: Reshaping the workplace. London: PricewaterhouseCoopers. Rayton, B. (2012) Employee Engagement Task Force “Nailing the evidence” Workgroup. Bath: University of Bath. Retrieved on 5 February 2017 from http://engageforsuccess.org/wp-content/uploads/ 2015/09/The-Evidence.pdf. Reynolds, J. (2016) Mindful Life, Mindful Work. www.mindfullife mindfulwork.com, May 2016. Rezek, C. A. (2012) ‘A Mind to Manage’. The International Journal of Leadership in Public Services 8(1), 33–38. Rogers, C. R. (1957) ‘The Necessary and Sufficient Conditions of Therapeutic Personality Change’. Journal of Consulting Psychology 21. Rosen, D. L., Carrier, L. M. & Cheever, N. A. (2013) Computers in Human Behavior 29, 948–958. Rumi (undated) ‘The Guest House’. From Jalal al-Din Rumi, The Essential Rumi (2004). Translated by C. Barks with J. Moyne. New York: Harper Collins. Salovey, P. & Mayer J. D. (1990) ‘Emotional Intelligence’. Imagination, Cognition, and Personality 9: 185–211. Salovey, P., Mayer, J. & Caruso, D. (2004) ‘Emotional Intelligence: Theory, findings, and implications’. Psychological Inquiry 197–215. Saltzburg, S. (2002) Lovingkindness: The revolutionary art of happiness. Boulder, CO: Shambhala. Seligman, M. E. P. (2009) Three Good Things. YouTube video. Retrieved on 27 July 2016 from https://www.youtube.com/watch? v=ZOGAp9dw8Ac. Smallwood, J. & Andrews-Hanna, J. R. (2013) ‘Not all Minds that Wander are Lost: The importance of balanced perspective on the mind-wandering state’. Frontiers in Psychology 4: 441. Smallwood, J., Schooler J. W., Turk D. J., Cunningham, S. J., Burns, P. & Macrae, C. N. (2011) ‘Self-reflection and the Temporal Focus of the Wandering Mind’. Conscious Cognition 20, 1120–1126. Stawarczyk, D., Majerus, S., Maj, M., Van der Linden, M. & D’Argembeau, A. (2011) ‘Mind-wandering: Phenomenology and function as assessed with a novel experience sampling method’. Acta Psychologica 136, 370–381. Sternberg, R. J. (1985) ‘Implicit Theories of Intelligence, Creativity, and Wisdom’. Journal of Personality and Social Psychology 49(3), 607–627. Sternberg, R. J. (1998) ‘A Balance Theory of Wisdom’. Review of General Psychology 2, 347–365. Suddendorf, T. & Corballis M. C. (2007) ‘The Evolution of Foresight: What is mental time travel, and is it unique to humans?’ Behavior Brain Science 30, 299–313. Suzuki, S. (2017) Zen Mind, Beginner’s Mind: Informal talks on Zen meditation and practice. Retrieved on 17 January 2017 from https://medical.mit.edu/community/wellness/classes/mindfulness-meditation. Taren, A. & Creswell J. (2015) Mindfulness and Amygdala Resting State Connectivity. Social Cognitive and Affective Neuroscience Advance Access. Oxford: Oxford University Press. Turakitwanakan, W., Mekseepralard, C. & Busarakumtragul, P. (2013) ‘Effects of Mindfulness on Serum Cortisol of Medical Students’. Journal of Medical Association of Thailand 96(1) 90–95. Welch, C. (2015) Personal Interview at The Mindfulness Summit, 16 October 2015. Whitesman, S. (2016) Mindfulness. Personal Interview in May 2016 by telephone. Zhang, C. & Stewart, J. (2017) ‘Talent Management and Retention’. In H. Goldstein, E. Pulakos, J. Passmore & C. Semedo, The Wiley-Blackwell Handbook of the Psychology of Recruitment, Selection and Employee Retention 475–495. Chichester: Wiley. Zylowska, L., Ackerman D. L., Yang M. H., Futrell, J. L., Horton, N. L., Hale, T. S. & Smalley, S. L. (2008) ‘Mindfulness Meditation Training in Adults and Adolescents with ADHD: A feasibility study’. Journal of Attention Disorders 11(6), 737–746. moreso for people who want to integrate mindfulness as a way of life at work and at home.